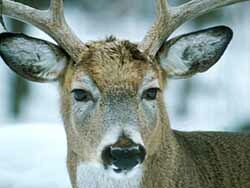 Researchers at UW Madison have made a new finding about the disease that threatens Wisconsin&apos;s deer herd. Researchers have known that the rogue proteins, or prions, that cause chronic wasting disease can remain in the soil for a long time. But now they&apos;ve discovered that certain soils actually boost the prions&apos; ability to infect. In fact, a group led by UW-Madison prion expert Judd Aiken found a common soil mineral can make the CWD prions as much as 700 times more infectious. (The researchers&apos; findings are written up in the journal Public Library of Science (PLos) Pathogens ) What does that mean for efforts to combat the disease in Wisconsin? Aiken says efforts to reduce the number of deer is a good goal for combating CWD — but this research indicates that infected areas are likely to remain infected for some time.